Every week, people in churches all over the world sing songs to God, joyfully telling about the greatness of who He is and what He does. This is praise! It is a passionate and heartfelt adoration to our Lord! A popular song of praise is the Doxology. 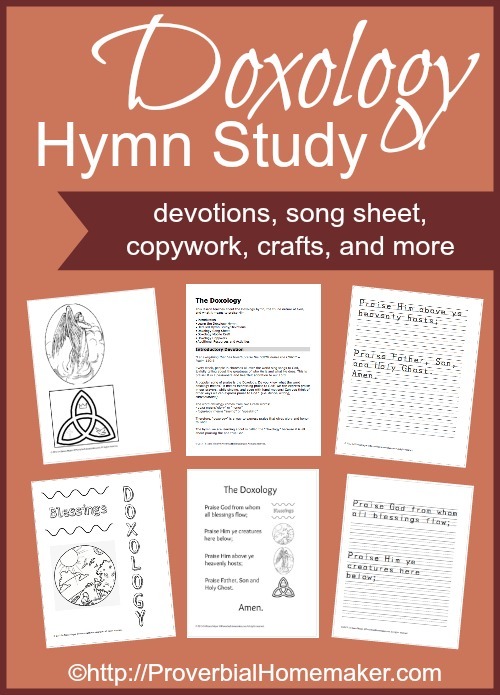 This lesson teaches about the Doxology hymn, the triune nature of God, and what it means to praise Him. Children will learn the song, make a mobile, and discuss the meaning behind the verses. I am just now getting to this and when I downloaded it, it is missing the part of the mobile that says God and Praise. Just thought I would let you know. We are loving the lesson! Thanks! Thanks for letting me know! It’s fixed now, so if you re-download it, the praise/god page is in there. Sorry about that! My email address was entered wrong. I would love to be able to receive this download. How can I get this sent to my correct email address? Hi Robyn! No problem. Just enter your correct email address in the download form and it will send it to you. If you run into a problem, you can email me and I will get it to you directly. Thanks! Hi there! I just downloaded this and it is missing the “Praise” and “God” part of the mobile. Just wanted to let you know. I thought about using this as a craft for one of my American Heritage Girls meetings since I just taught them The Doxology. Thank you for providing this! Sorry about that! It’s fixed now. Emailing you the correct version as well.